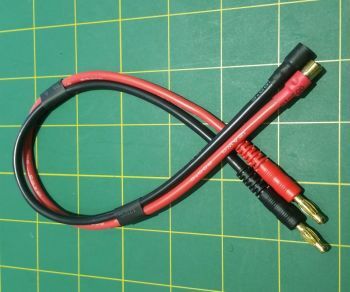 OSE Charger Output Cable for OSE 6.0mm Bullet Connectors. Over 12" (300mm) long, 12 ga silicone wire, two 4mm Male Banana Plugs attached one end, and OSE 6.0mm bullet connectors soldered on the other end. -Male OSE 6.0mm on positive end, Female 6.0mm on negative end.